Mt Austen is a jumble of peaks at various heights. As you can see from this map, The Gifu strongpoint (the jungle area between Hills 31 and 27) was at a lower elevation. Down on the coast you can see the Matanikau river sandbar. Just across the Matanikau from Gifu are the Seahorse and Galloping Horse (Thin Red Line) battle area. Henderson Field is about 9 miles to the left in this picture. The Japanese were sending raiding parties from Gifu were poking about around the field. US forces wanted to push to the west (right of photo) the Army command could not leave the Japanese Gifu forces on their flank. The present surfaced road goes up to the summit of MT Austen where the Japs had their Oberservation Post. The view across Henderson and the whole perimeter is magnificent. This is an interesting area. The "Grassy Knoll" position on the top of Mt. Austen was used by Japanese artillery observers to direct their artillery fire onto Henderson Field. It also commanded and the view across the whole Marine perimeter and is a very good observation post. Nearby there were overgrown slit trenches. The present village was built in the 1960's on the western edge of the Gifu between Hills 31 and 27. When they cleared the ground years ago to build it they found a lot of items, as the fighting here went on here for two months. In 1996 the locals had found helmets, mess tins, water bottles - even the wheels from the Japanese 70mm gun captured by the Americans on the hill. During the American surprise attack the Japanese crew had been caught resting under trees 30 yards from the gun and been cut down as they ran to man it - one wheel has a bullet hole through it. The Americans then used the gun against the Japanese until the ammunition supply ran out. The gun had been taken apart and buried in foxholes - 50 years in the ground but 90% paint and wood still remained on the wheels. When we went there in 1995 the first things we noticed as the taxi pulled up was a large segment of Betty bomber wing, still with the red primer paint and most of the "meatball". There were also engine controls and a Zero drop tank leaning against a tree, (from the Lunga Point area they said). Not wanting to see these items go the way of the Betty tail fin at Bloody Ridge the museum let it be known they would not be pleased if the aircraft remains went "missing". These fragments were still there in 1996, although deteriorating and losing paint out in the open. Stan Gajda in 1998 up in the GIFU ravines. Those are US mortar shells I believe. He said there was a lot of unexploded stuff in the ravines, plus other bits and pieces. 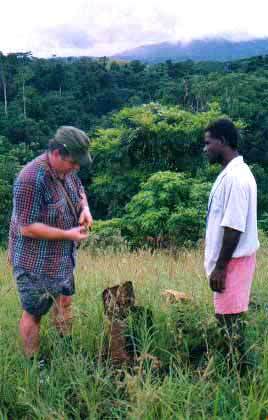 A lot of US mortar shells did not go off as the guy who guided me to Thin Red Line Area had a lot of live ones he had collected from the ridges! In 1999 locals wanted $50 to climb Hill 27. The greed factor not previously there. With all the post June 1999 ethnic tension it is a no go in this area. In 1999 that Hill 27 had been gone over by a fine tooth comb, nothing much left in the foxholes now. 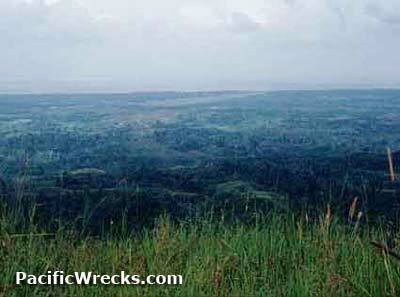 I was told in 1999 that the place to look is on the steep slopes that drop towards the Matanikau. The Japanese lost about 100 men in the Hill 27 battle and I think most of them have been likewise dug up by the Japanese and cremated at their memorial on hill 27, but bones and skulls can still be found in the ravines. From November 1942 to January 1943, under commanded by Col. Akinosuke Oka the 247th Infantry Regiment and 2nd Battalion of the 228th Infantry Regiment were based here Mt. Austen then fought against the 192nd and 182nd infantry regiments of Americal Division and 35th Infantry Regiment of 25th Division. There were not the foods for eating, and the ammunitions to fire. The battlefield were sure hell! Japanese Major Zenshichi Nishihata and his 2nd Battalion/124th Commander Major Takeyoshi Inagaki and his 2nd Battalion 228th assaulted to investigate then suffered an honorable defeat on the dawn of 28 January 1943. Ribbed containers are Japanese gas mask respirator cans. 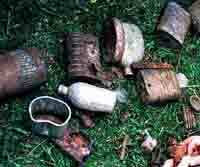 In 1998 another search of the hillside turned up cartridges , ration tins , grenade tin and 60mm mortar tin lids , grenade segments , grenade handles, a 75mm ammo tin lid , US Carlisle bandage tins and various ammo clips. Further into some of the steeper ravines there were items scattered about . villagers found a Japanese skeleton near a cave entrance with a single US .45 caliber case outside - I guess he refused to surrender. We found and were shown helmets, gas mask respirators , mess tins with US canister ammo shot holes through them , ammo clips, shovels etc., some of which we got for the museum. One US water bottle I found here was marked M. ROMERO with a serial number. I wrote to the US Army Records Dept . Most of his file was lost and all they could tell me was that he enlisted in October 1941 and was discharged in September 1943 , so he survived Guadalcanal at least. One villager could not work out why all these "canteens" seemed to be full of stuff until I explained to him . 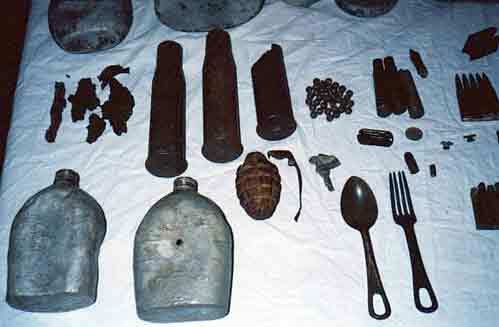 The village was built on part of the battlefield and they found lots of stuff when they cleared the land . The good Jap mess tins are still used for cooking! 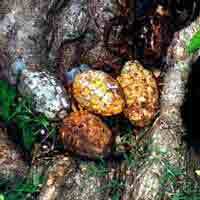 Lots of live grenades there , US and Japanese, but we did not fool with those. Got a couple of empty ones though, but it was the live ones that had the 99% yellow paint. 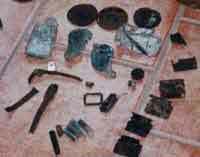 There were US grenade handles, bits of fuse and the metal lids off the grenade tins scattered on the rear slope. On the way back down I passed a recently excavated foxhole with helmet fittings and about 20 BAR magazines scattered around. The present road goes past Hill 31 and you turn off to the right down a 600 yard dirt road to get to the village. Hill 31was the site of the mass grave of the last 85 Japanese defenders killed during the final breakout attempt There were foxholes nearby and shattered pieces of helmets and shot up water bottles in the grass. 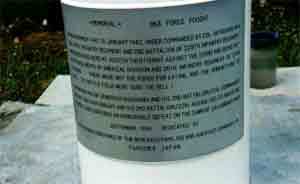 In 1984 the Japanese came back and dug up the bones and erected a monument. There were still shattered and shot up pieces of water bottles and helmets around the area when we were there. The locals said the Japanese recovered lots of bones in 1984 at the foot of the hill, in the area of the Japanese counterattacks. The Japanese still periodically search for remains and cremate any bones found at the memorial in a bowl - in 1996 we found a half burnt Japanese leather helmet liner in the bowl. 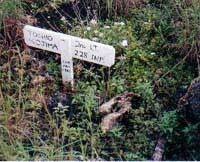 John Innes erected the cross for Toshio, when the bones were found in October 1995. All the implements around him in the foxhole were American and he was in an American foxhole. From his dog tag we were able to establish his identity. He was Toshio Kojima of the 228th Infantry. 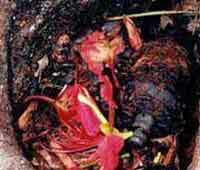 In 1996 a Japanese bone recovery team did take some bones from the grave. Some of his bones became part of a bone burning ceremony at the Japanese memorial. 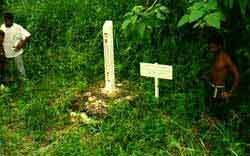 The grave however still has some of Toshio's remains.